The first day of the New Year falls on the new moon, which was 8th February this year, and the festival continues until the full moon 15 days later. The celebrations started a day earlier on Sunday 7th, when families gathered along the Esplanade to wander around the zodiac installation, chase soap bubbles and launch plastic FlyCopter toys into the air – when it’s dark, the little blue lights flying up and down to the backdrop of the lanterns and balloons are just so pretty and fun it’s hard not to laugh out loud with sheer delight as you soak up the magical scene. The first week of the New Year is the main holiday period for the Chinese people. On these days the traffic is busy and Chinese restaurants and stores are closed as families visit each other, eat together and exchange gifts and well wishes. Most of these days are pretty quiet for us foreigners, but there are plenty of exciting public events over the fortnight to keep us entertained! 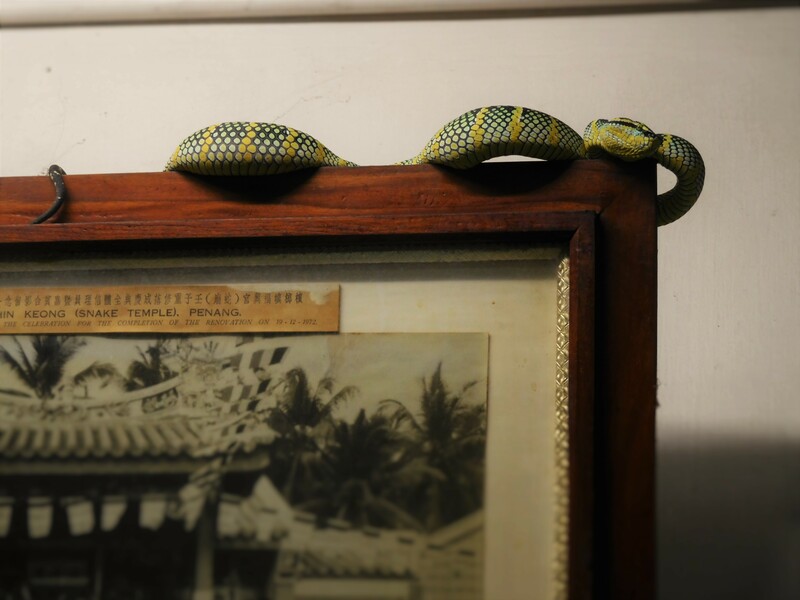 The 5th day of the New Year, on Friday 12th, saw one of the bigger celebrations taking place at the Snake Temple in Penang, so-called because of the numerous snakes (yes, real live ones) hanging out inside. 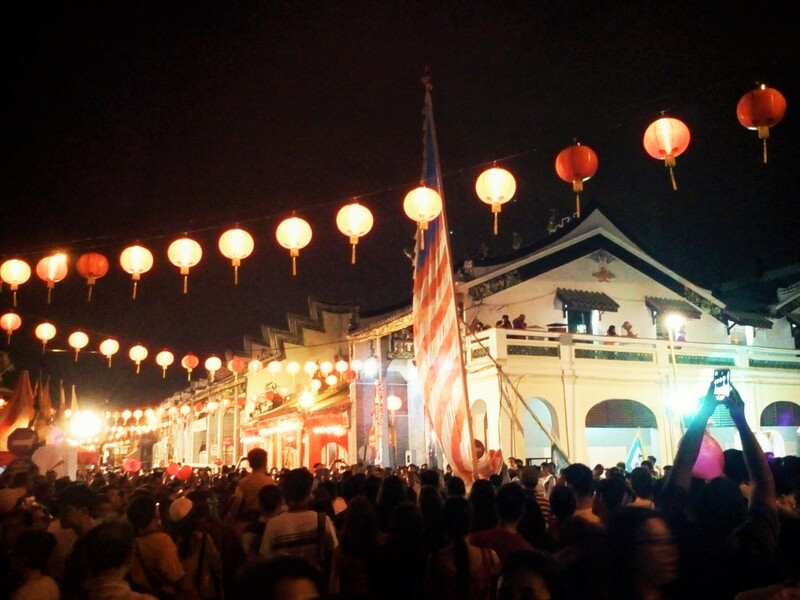 The atmosphere here, as with many of the other events throughout the New Year celebration, is an interesting mix of festive fun and devotion. Walking up towards the temple, you pass by souvenir stands, food stalls, loud music and street performances. Arriving at the temple itself you are greeting by a more devout scene as many worshippers are seen praying with incense offerings. The temple was built in honour of Chor Soo Kong, a deified 11th century Buddhist monk, and with his birthday falling on the 6th day of the New Year, many worshippers come to pray and offer birthday wishes. 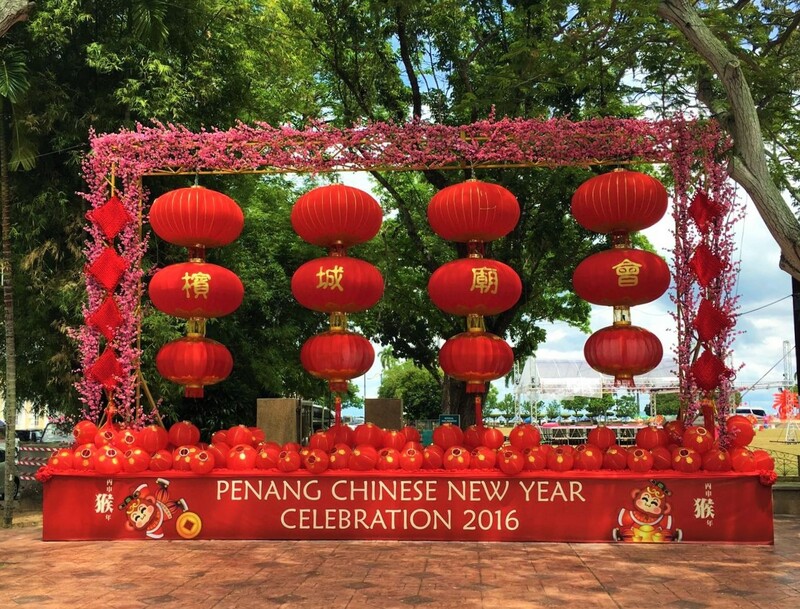 A “Fire Watching” ceremony also takes place, where the flame height of special fires is said to predict the economic outlook of Penang for the coming year. Unfortunately this ceremony is held within the temple and with crowds of people trying to squeeze into the small space, I wasn’t able to get close enough to actually see what was going on! My disappointment was short lived, however, as I was soon distracted by the impressive fireworks display which served as the climax to the evening. Fireworks and firecrackers are ubiquitous throughout Chinese New Year, as the Chinese believe that the loud noises scare away any evil spirits to welcome luck and prosperity for the coming year. The following day, many streets in Georgetown are closed to traffic, and lined with stalls and various stages for the official street festival celebration. 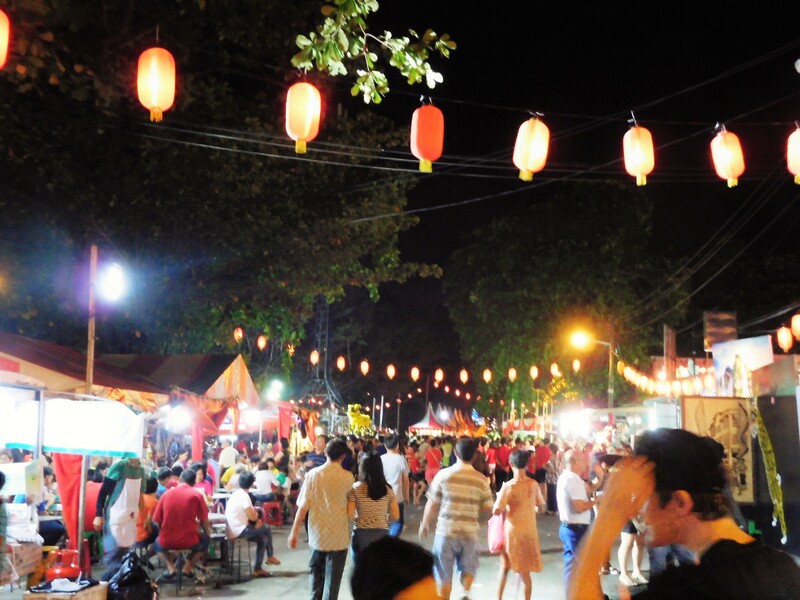 From about 5pm, the streets are lined with people wandering from one stage to another, munching on hawker food along the way. 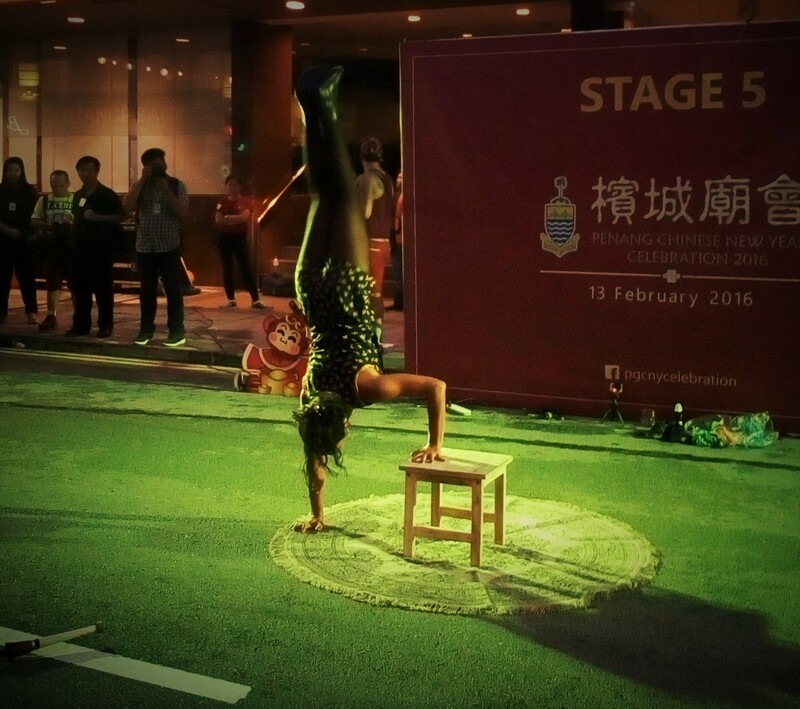 Joining them, I took in a variety of performances including dancing, singing, flag tossing, acrobatics, martial arts and my favourite, an exciting and dramatic diabolo group show. On this day, various Chinese clan houses in the area also open their doors for the public to visit and take in the intricate architecture and artwork within. 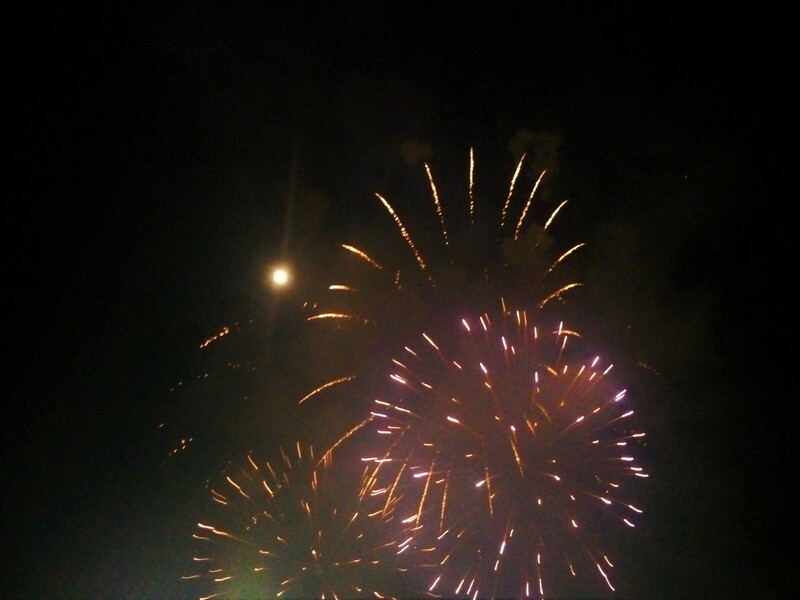 The atmosphere on the streets was fun and lively, and yet again, the party came to a close with another impressive fireworks display at the Esplanade. 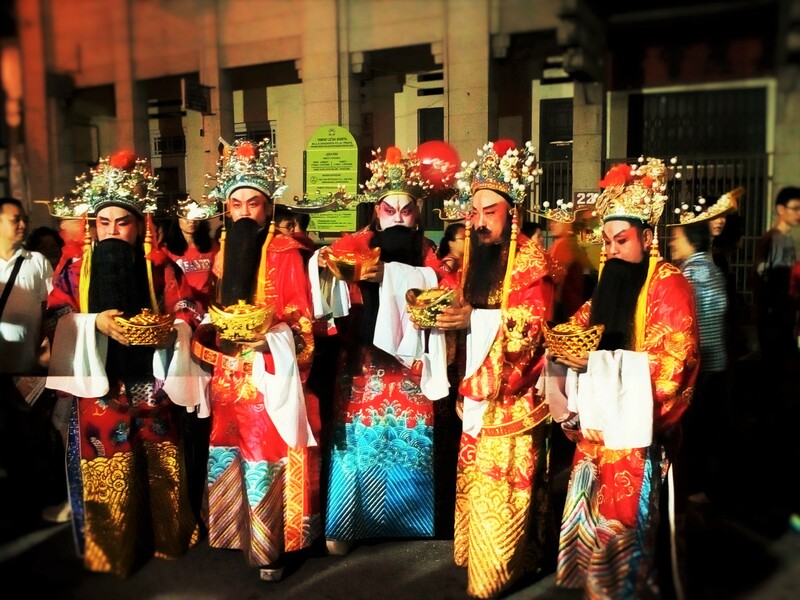 This event is actually a Hokkien celebration – the Hokkien people are descendent from the southern Fujian area of South China. 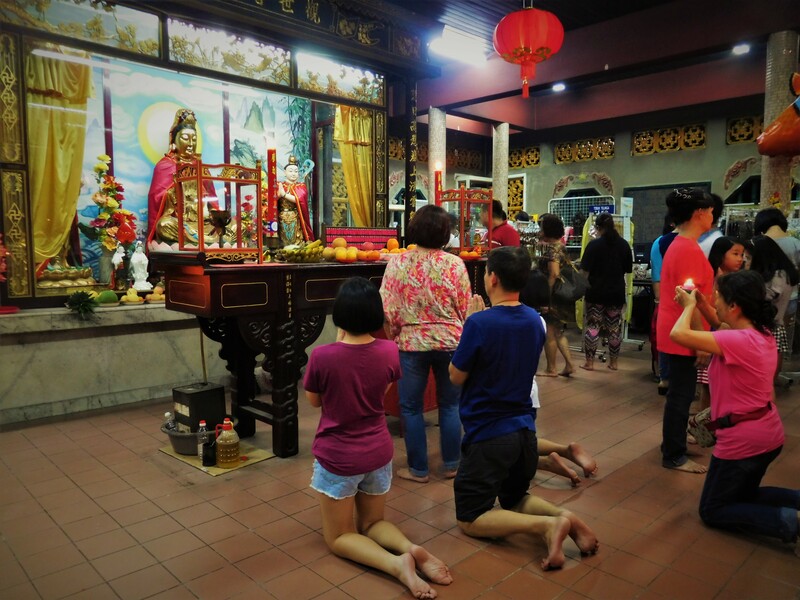 On the 8th day of the lunar year the Hokkien people celebrate the birthday of the Jade Emperor, their supreme deity who sits above all others, and ring in their own version of the New Year. This was one of the stand-out days of all the celebrations I experienced. 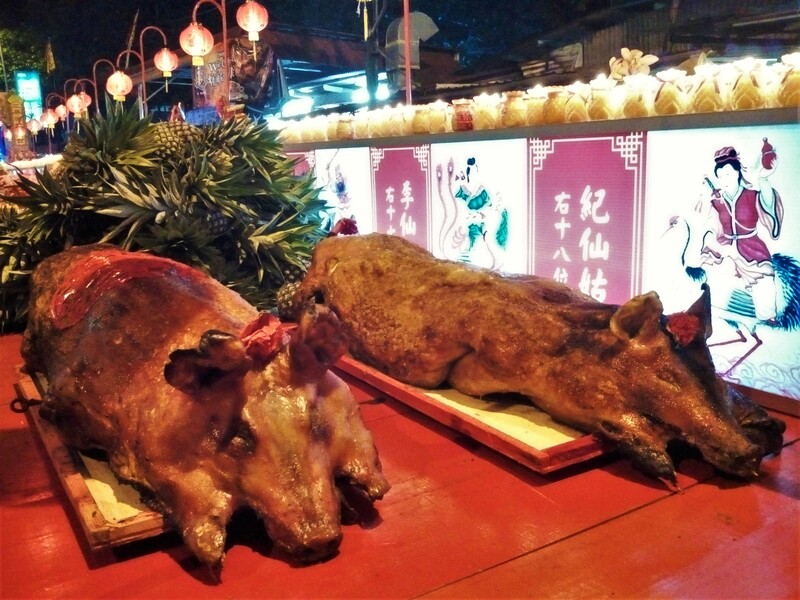 Taking place at Chew Jetty in Georgetown, the street is lined with a huge table full of food offerings to the Jade Emperor, including the traditional offering of whole roasted pigs! Once again I was surrounded by people praying with incense to the various altars set up outside and within the temple. Of course, fireworks are a given at this point, but the number and volume of the Hokkien explosions makes the rest of the Chinese New Year fireworks seem like sparklers! 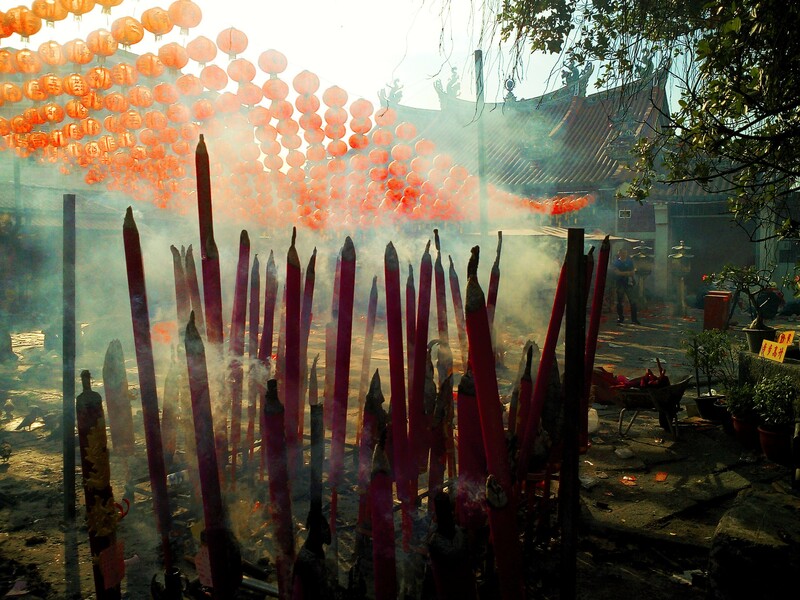 They are firing all through the evening, but at midnight, the whole area just becomes a cacophony of sound as endless boxes of fireworks are set off all the way up and down the street, as well a deafening firecrackers set off on the ground or around one of the altars at the temple. While all this noise was going on above and around me, I was squashed up against the entrance of the temple itself. After a group of devotees dressed as various deities make their offerings within the temple, it is time for the crowd of worshippers to receive blessings from the god of prosperity. Ang pao are traditional gifts throughout Chinese New Year, often given to children and unmarried family members, and are given out on the street at the various public events over the two-week period. They are red envelopes containing a small amount of money and are said to bring good fortune to the recipient for the coming year. 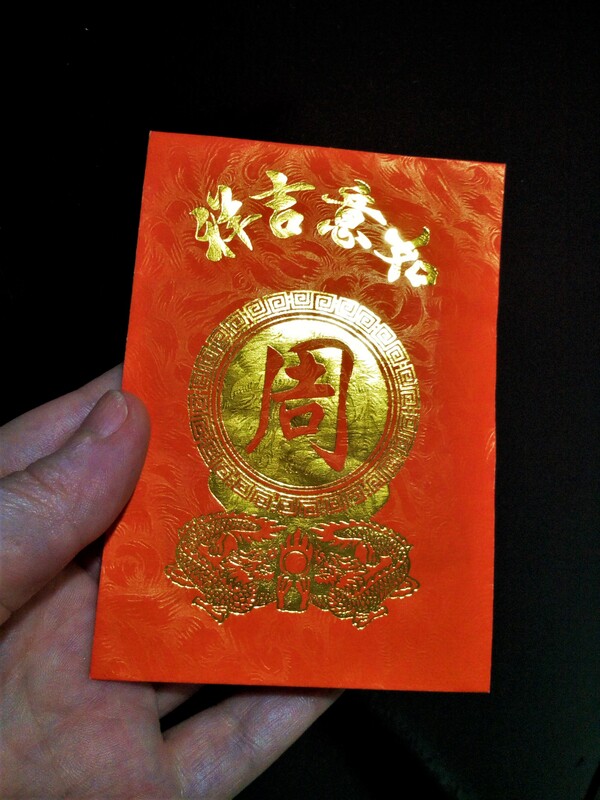 For Hokkien New Year, the god of prosperity hands these out himself in the temple, Santa Claus style – so you can imagine the crush at the doors to receive them. Luckily I just happened to be standing beside the doors when the crowd started filing in so I was able to slip into the line of people entering the temple, to some bemused glances and smiles as I was the only foreigner there! 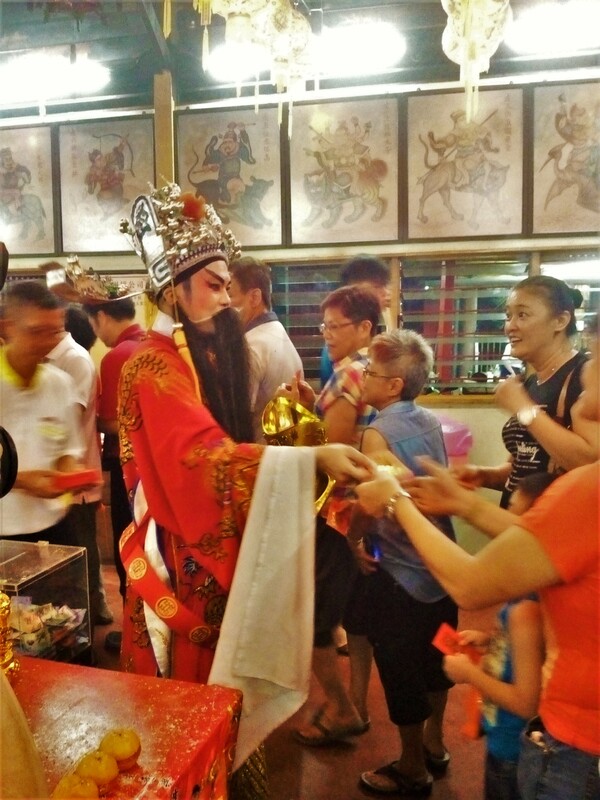 Even though I didn’t quite understand what was happening, I bowed my head with gratitude as the god placed the envelope in my hand, before following everyone else in a circuit around the small temple, bowing again with respect as we passed the Jade Emperor altar at the back of the room. It was really one of those moments when I felt so very fortunate to be here – in this amazing place, taking part in an ancient and traditional ritual with local people, who themselves are nothing but warm and kind to this wide-eyed white-skinned stranger in their midst. I stopped various people throughout the evening to ask what’s going on with this?, and who’s that guy?, and why are they all going over there? On this night, as indeed during the rest of the two-week celebrations, they always responded with warm smiles and helpful information or advice. 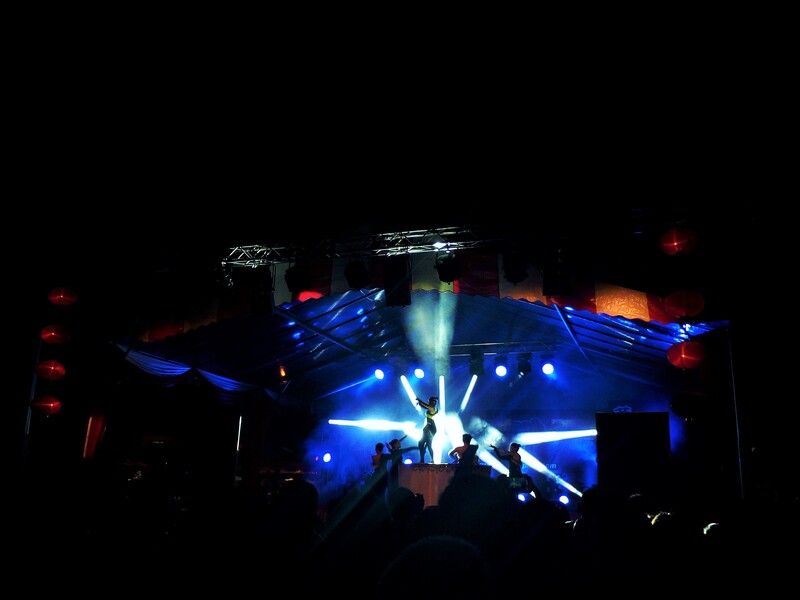 I came home from this one on an absolute high from the joyful energy soaked up throughout the evening. 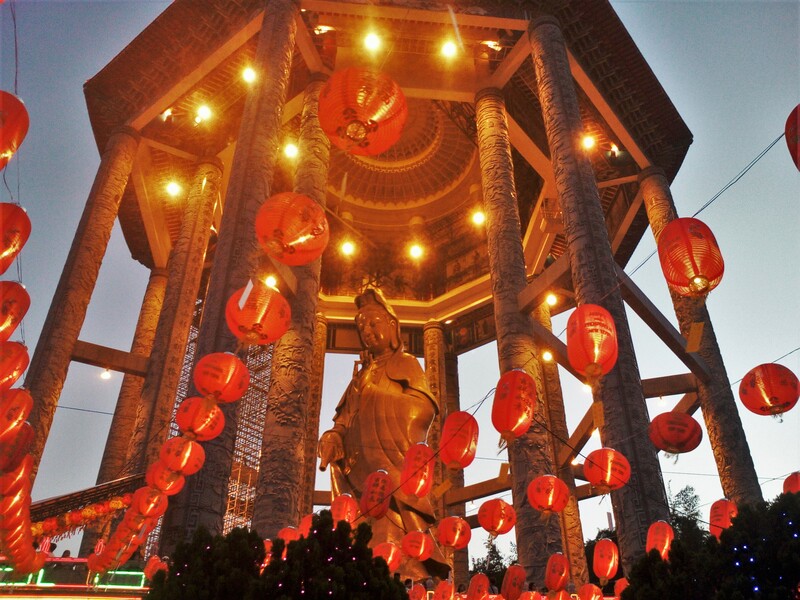 This Buddhist temple is said to be the biggest in Malaysia and one of the biggest across South East Asia. It is a domineering and beautiful structure sitting on a hillside overlooking the town of Air Itam. The construction includes several prayer halls, pathways, a large pagoda and a pavillion housing an enormous statue of Guanyin, the Goddess of Mercy. 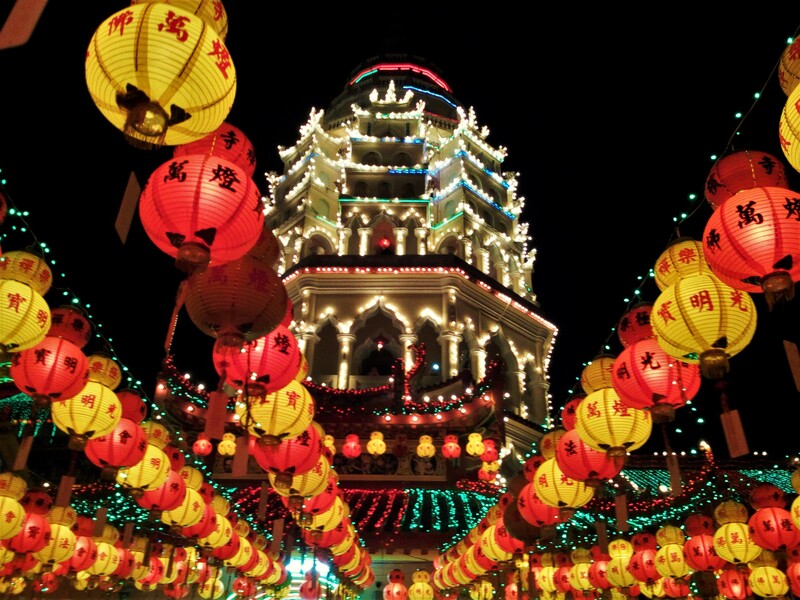 During Chinese New Year, worshippers flock to this temple to offer coins in a circuit around the base of the statue, as well as writing wishes on ribbons and placing them on the many ribbon trees in place around the temple. 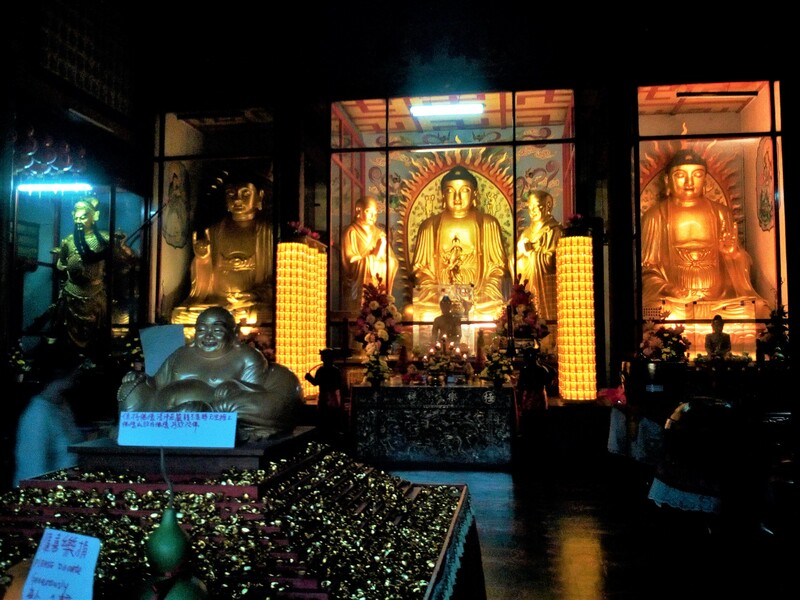 The architecture itself and the styles of the 10,000 Buddha images within the temple reflects a recognition of the diversity of ethnic origins of Buddhist devotees attending the temple. 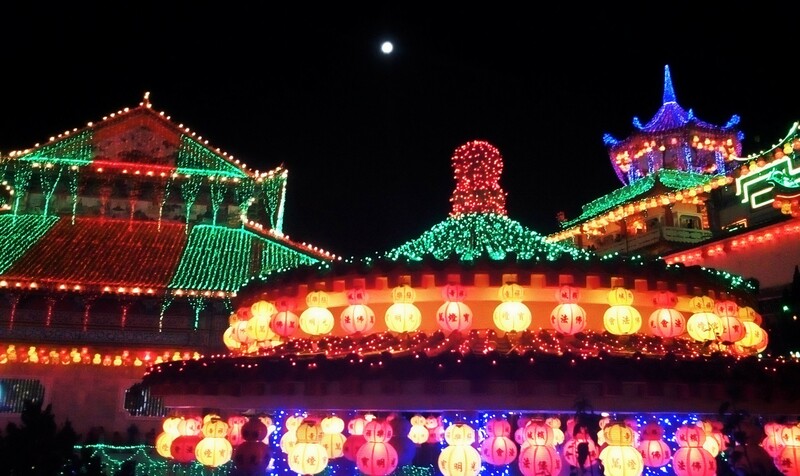 It is an incredible space, worthy of a visit at any time of year, but the Display of Lights over the Chinese New Year period is a sight to behold. From about 7pm thousands of lanterns and fairy lights are switched on, turning the temple into a magical wonderland of light in the darkness. 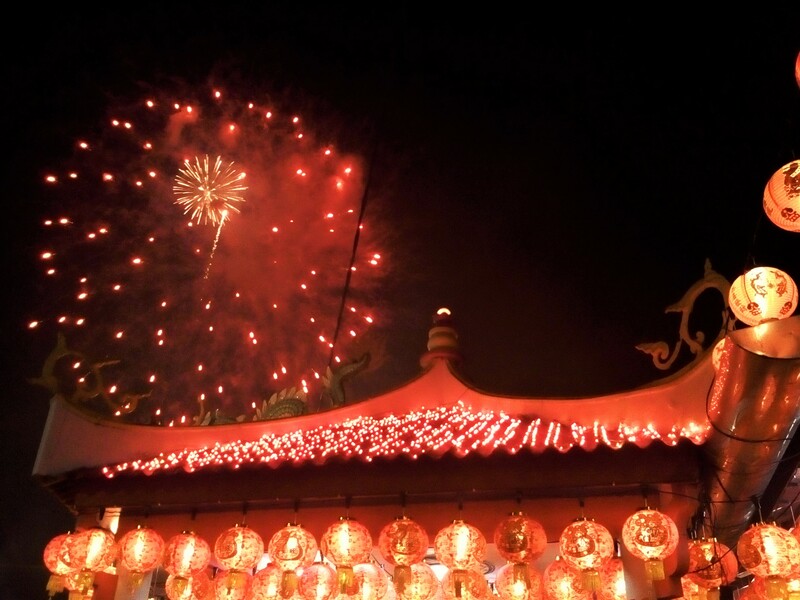 Last but not least, the Chinese New Year celebrations culminate with Chap Goh Meh – translated simply as the 15th day of the New Year. This day is also traditionally considered as the Chinese equivalent of Valentine’s Day, due to the tradition of unmarried women writing their name and contact details on an orange and throwing it into the sea in the hope of finding a suitable husband. 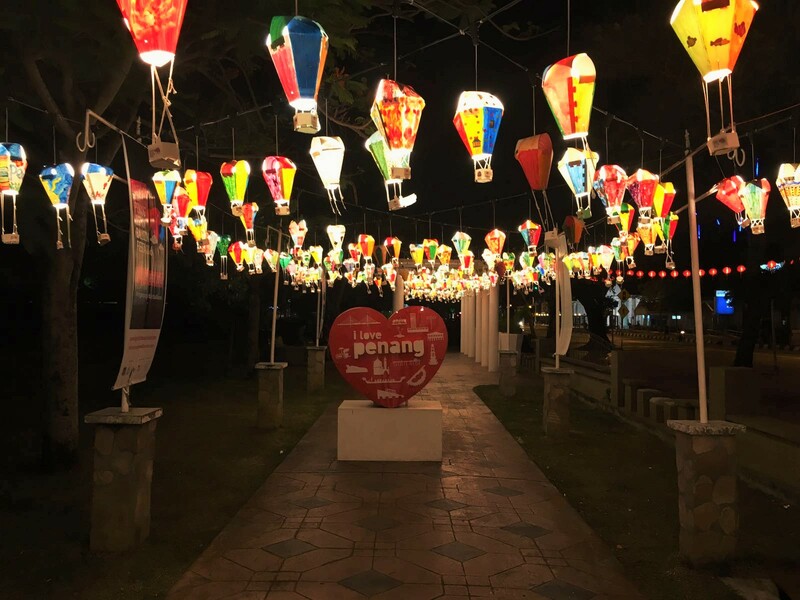 This unusual tradition actually originated in Penang, so once again, there is no better place to witness it – and participate! 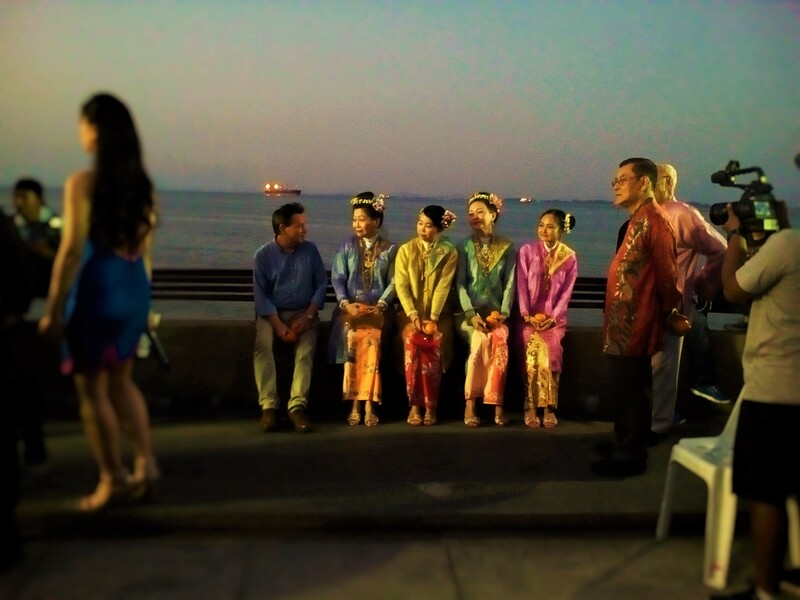 Gathering at the seafront, the event kicked off with a bit of a media frenzy as a group of nyonyas, women who are descendant from the Chinese immigrants to Malaysia between the 15th and 17th centuries, threw the first oranges into the sea. After that, the seafront wall was crowded for the evening as women (and some men!) threw orange after orange in the hopes of finding the perfect partner. My friends Piet and Julia recorded the whole event, so you can check it out and see me sending off my own orange over on their Digital Nomad Daily YouTube channel! 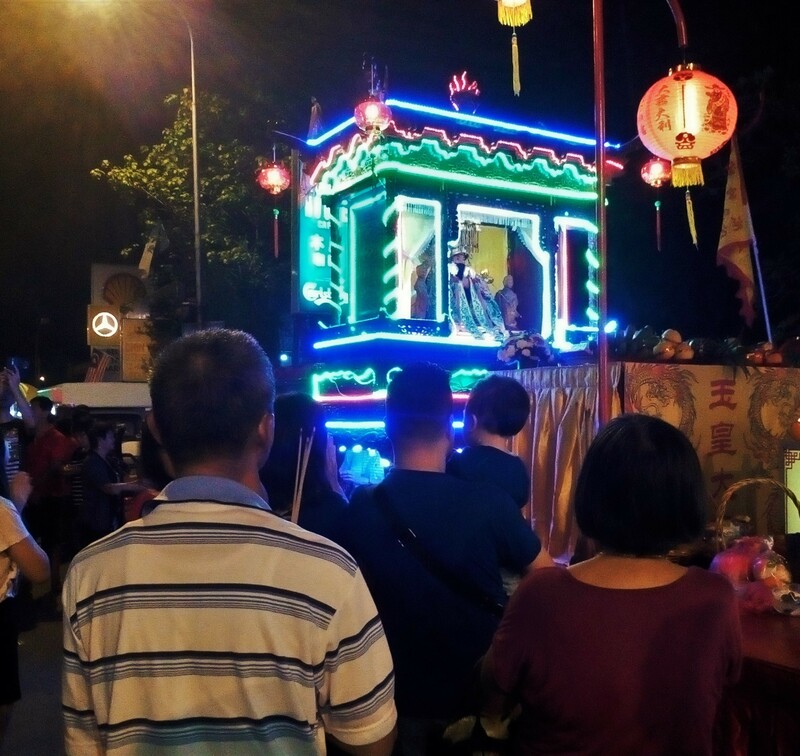 This tradition is only half the story of Chap Goh Meh, however, as the Chinese people close the New Year celebrations with the biggest night of them all. The main stage at the Esplanade saw some of the best performances of the entire festival, all the while those ever-present FlyCopters did their pretty blue dances in the sky in the surrounding park. 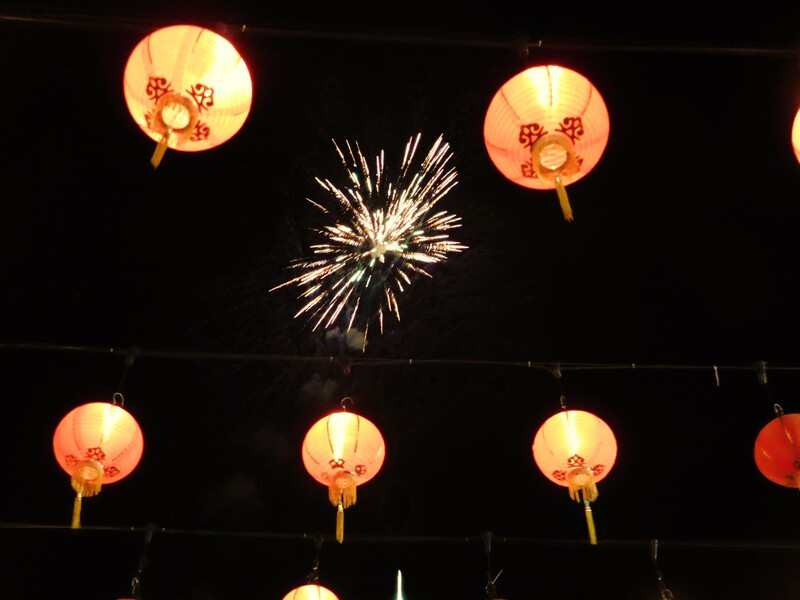 Of course, no Chinese New Year event would be complete without, yes you guessed it, even more fireworks – this biggest display of the whole two-week period brought the festival to a close. 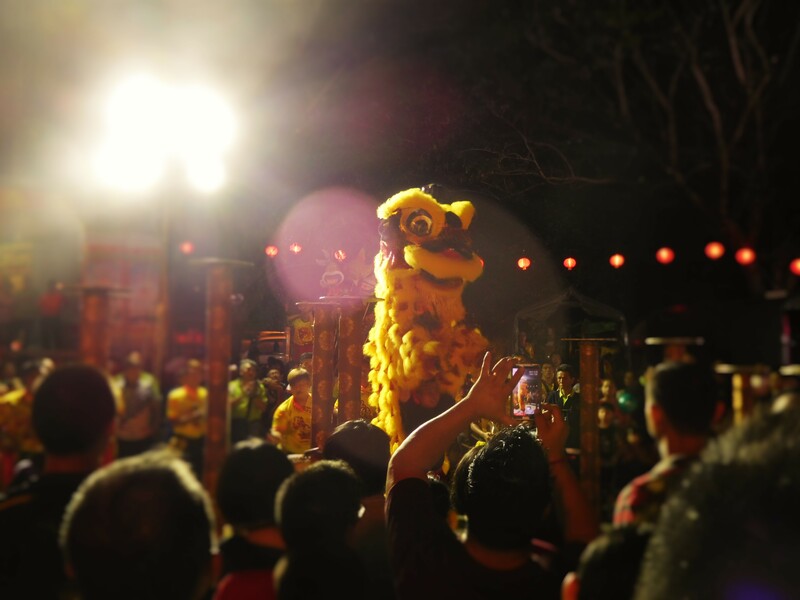 The Chinese New Year festival is an interesting mix of party and prayer, with all the festivities you would expect for welcoming a new year by any calendar, on top of the various divine birthdays and celebrations happening to fall within the same lunar period. But by far the main aspect of whole event is the emphasis on luck and good fortune. 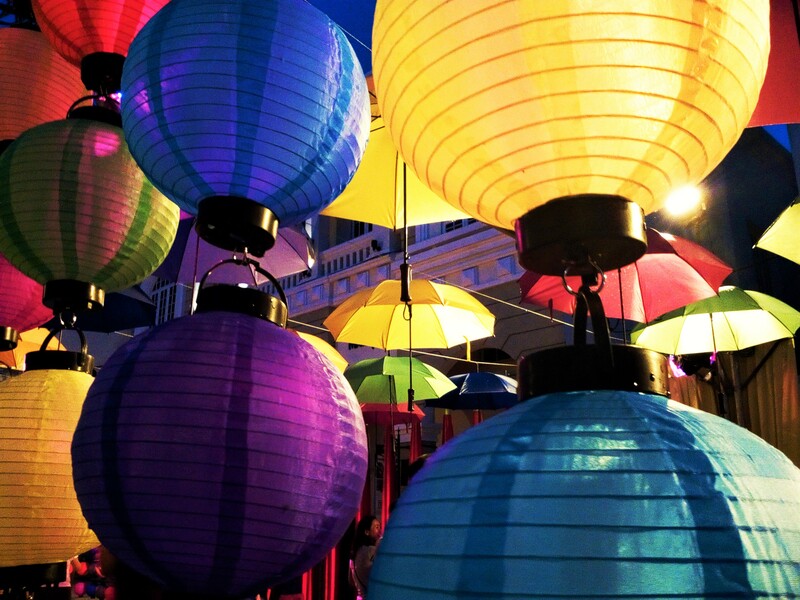 The Chinese are big believers in the power of lucky charms, symbols and colours, which is apparent across the various Chinese New Year traditions. The colour red represents good fortune and joy, and so is the predominant colour throughout the festival – the lanterns and decorations are red, many people wear red clothing, the ang pao envelopes are red. Orange and mandarin fruits are said to represent gold, therefore these are also frequently offered back and forth in the hope of welcoming good fortune and wealth. 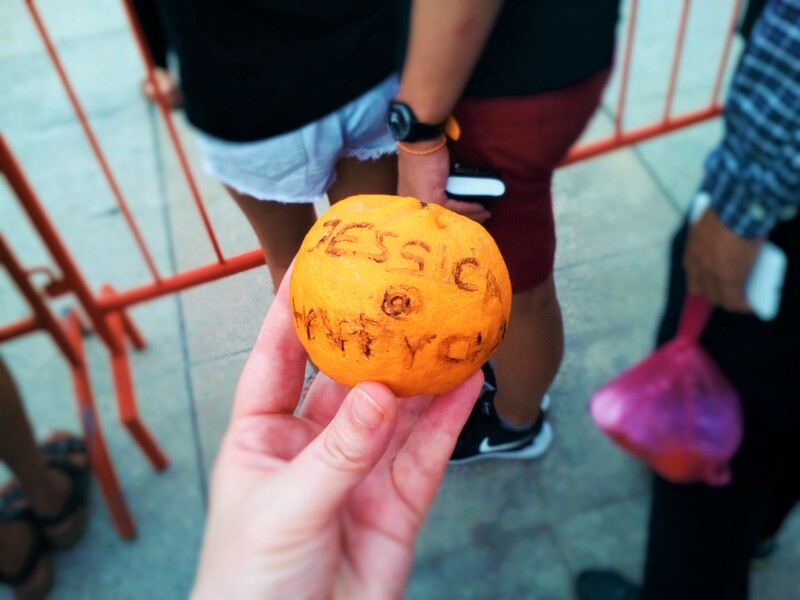 I understand now why a homeless man reacted so emotionally when I gave him the orange that someone else had handed me during Hokkien New Year. I hope it brings him good fortune this year. Almost everyone I asked about the various customs I observed – from the many lion and dragon dances over the two weeks, to the offering of coins and ribbons at the Kek Lok Si temple, to the endless fireworks and fires burning outside temples – told me that each action was carried out to usher away bad luck and bring good fortune and prosperity for the coming year. It reminded me of the devotees I observed at the Hindu Thaipusam festival, where faith in the ritual can hold enough power even to suppress pain and blood flow! If you haven’t read that post yet, check it out here! The fact is that the efficacy of any tradition or ritual comes down to how much you believe it will work. This is really the essence of the Law of Attraction – ask, believe, receive. At the end of the day, whatever customs you follow or faith you subscribe to, believe in it with all your heart and it won’t do you wrong. After seeing the enthusiasm with which the Chinese people conduct these rituals, I would bet that the year ahead will be a good one for most.